I just searched a little in vain for a good picture of her hair before it got cut for a comparison. You can see where Savannah missed a little bit, though, and it was easily 4 inches that she cut off. Plus it was all her beautiful little baby curls that once you cut them off they're gone. I was so sad! I normally try to cut the girls' hair myself to save money but this was enough of a hack job that I didn't want to attempt it on my own. 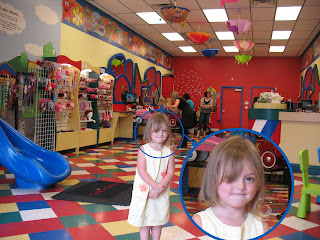 The next day I took her to Fantastic Sams because I had a coupon but it was really crouded and hectic and there was a wait and while I waited I realized that getting her hair styled (which I knew I wanted so I could see how to style it short) would be $6 extra so it was going to cost $14. 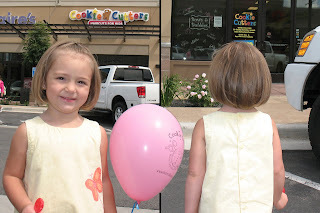 I had heard a friend talk about a place called Cookie Cutters that specializes in kids haircuts but I imagined it would probably be about $30 for haircuts there. I figured I might as well just call them while I was waiting and I couldn't believe it when they said haircuts were $13.95 and that includes styling! We drove right over and I was SO impressed with that place! I would HIGHLY recommend it, especially if you have a kid who's a little afraid about getting their hair cut or if it's a first haircut or something where you want a place that's camera friendly. The kids get to pick a cool little car to sit in instead of a normal chair and they also pick a DVD to watch while they're getting their hair cut. Then when they're done they get a balloon with a sucker and a cute little cookie cutter on it. Katie LOVED it! Alex also had a great time playing on the little slide while he was waiting. Here's a picture of her in the place so you can see how fun it is (plus another pitiful looking "before" picture). 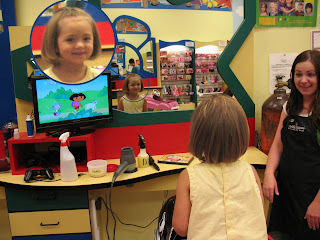 She was so immersed in Dora I don't think she even realized she was getting a hair cut! Katie's first look of her new haircut in the mirror. 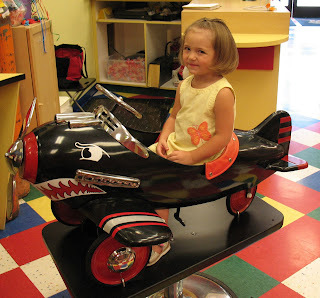 She picked this plane to sit in. I was very happy with how it turned out. It looks like such a little school girl haircut to me and I think it makes her look older and more grown up. It's sad but also cute and it's perfect timing because she'll be starting preschool in just another week. It's crazy how fast kids grow! Yeah!!! You always have the best stories! So stinkin cute, her hair is adorable. Vuestra segunda hija ya va al cole infantil. Enhorabuena. Seguro que Naomi va al pelu de abajo de nuestro local la semana que viene. Quiere volver a tener flequillo.